Srinagar: – Mohammad Hussain, 50, spent about two months in an open field in the Kaksar area of Kargil during the Kargil war between India and Pakistan in 1999. It was during the months of June and July he says, and people were able to move to safer places. The government was also active and helped the locals. This time, however, the situation is different. Hussain says if war broke out now when snow is around 10 ft deep, they will die inside their houses and there will be no one to bury even their dead bodies. “We are living in fear ever since Indian jets crossed the LoC and vice-versa, and only those people who live around the LoC know the true cost of war, as we are the first casualty,” Hussain, a Sarpanch from the Congress party, says while talking to TwoCircles.net via phone. He says the temperature in Kargil during the day is -10 degrees Celcius. “When you don’t have water to bath, how can you think of surviving a war”? he asks. Hussain says he along with his family are having sleepless nights these days as they worry where they will go in this “bone-chilling cold” if a war breaks out. It must be mentioned that the Ladakh division of the state remains cut-off from the rest of the country due to snow. The road remains blocked for around six months every year. Hussain says the provisions stored for the winter are often not enough during normal times and if war breaks down it will be disastrous for the people of Leh, Kargil, and Ladakh. Another local, Subhan Jaffari, says Ladakh shares 130 kilometres of the border area with Pakistan and even security forces are under 10ft snow. “We will suffer heavy damage and we have suffered in past too. It will be impossible for us to shift right now to better places,” Jaffari says. Jaffari says he has four daughters and is extremely worried for them. “Those who are beating the drums of war while sitting in their cosy rooms should see the conditions of the people living in the border area,” he adds. Bodraj Suchetgarh of Jammu sectors RS Pura says people in his area are of the opinion that war can break down anytime and they are moving towards safer places along with their family members. Boadraj, a government school teacher by profession, lambasted the Indian media for creating a war-like situation. “People are panicking because of the India media, the way they have created war hysteria has affected the people here. It is very unfortunate that the government is not able to handle them,” Bodraj says. He also slammed the government for failing to construct bunkers that were promised to them. “The tall claims of the government of constructing the bunkers remain only in papers. These bunkers could have been of use this time easily,” he says. It is pertinent to mention the Central Government approved the construction of 14,460 bunkers along the 740-km long border with Pakistan at a cost of Rs 415.73 crore last year. However, the project is far from complete and hence of little use to the locals. The dwellers alongside the LoC always face the brunt of cross-border shelling. In the last three years alone, 100 civilians have lost their lives and 300 civilians have been injured in border skirmishes. The government has ordered all government and private schools within a range five km from the International Border in Samba, Jammu, Rajouri, and Poonch to remain closed since Thursday. The nervousness is also visible in the town of Uri in Baramulla district after shelling continued late Tuesday night for several hours in the nearby villages of Kalgai and Kamalkote. Mohammad Dilawar of Gurez sector, North Kashmir, while speaking to TwoCircles.net said the locals constructed the bunkers themselves a few years ago and many families have shifted to their underground bunkers. Although there were no reports of cross-border shelling in that region, there is a lot of fear among the locals. According to latest reports, at least 60 families comprising around 300 people have fled their homes after firing from the Pakistan side killed 3 civilians in Poonch Village. The civilians fled for safety as Indian and Pakistani armies continued to pound the Line of Control. “We are poor people and cannot afford the loss of houses. 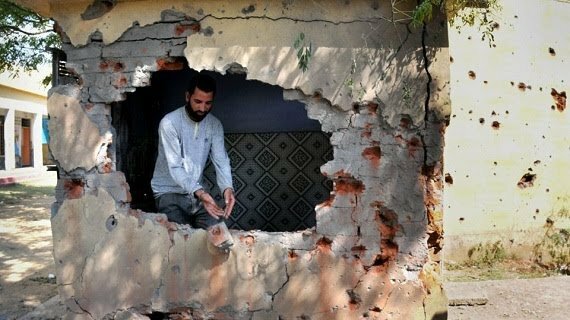 We are tired of living under the fear of getting killed or our houses getting destroyed in the shelling, ” said an elderly person Ghulam Hussain of Poonch to a Srinagar-based news agency. He urged both India and Pakistan to resolve their issues peacefully. Tension escalated between India and Pakistan after a Kashmiri suicide bomber belonging to the Jaish-e-Mohammed outfit blew up a bus killing 40 CRPF troopers on February 14 which prompted Tuesday’s air strike by India on a JeM camp across the LoC.